Pizza is a comfort food anyway you look at it, savory or sweet it satisfies your craving. 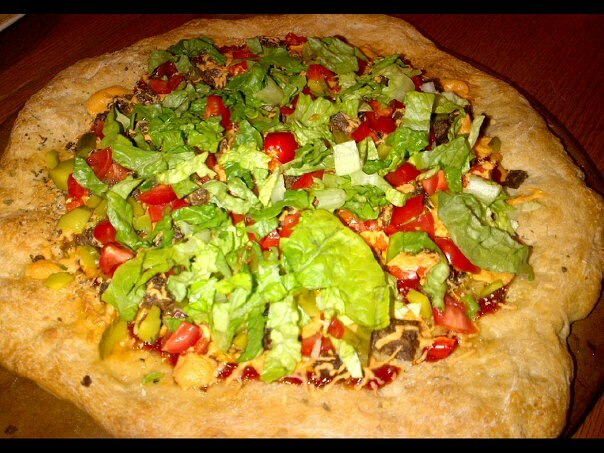 It has anything you want and then some packed onto a hearty crust. When making you own pizza you control everything that goes into it and you can add anything and everything, the possibilities are endless and you can let your imagination run wild. This recipe satisfies that craving for a burger without the bun involved. Great for events or just at home with the kids, it shows that being vegan is fun and can pack a lot of flavor into just one slice. Play with you food, you will enjoy the outcome. Enjoy! *The possibilities are endless to what you can add, its you version of a cheeseburger. Have fun and add everything and anything you love on yours. Let the pizza dough rest according to package directions. When ready press the dough into a 16-inch pizza pan, rimmed baking sheet, or pizza stone. When pressed season with nutritional yeast, salt, pepper, and seasoning of your choice that you like. The point is to season you crust and give it flavor. Place in the oven and bake for 10 minutes or until lightly golden and pre-cooked. When done remove from oven and set aside for assembly. In a large skillet, combine the peppers and onions. Cook over medium heat until the vegetables are tender, about 8 minutes. Remove from the heat. Next, add the thawed vegan burger chunks or crumbles and cook until combined and browned, 3 to 5 minutes. Remove from the heat and set aside for assembly. Use your already pre-cooked dough and spread the ketchup and mustard over the pizza crust. 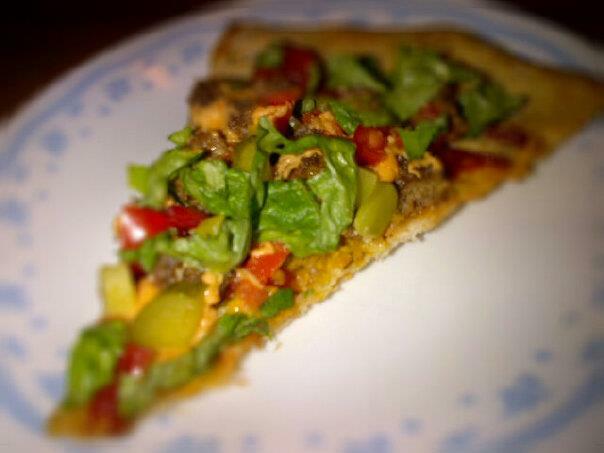 Top with the vegan beef , veggie mixture, vegan bacon (if desired), and vegan cheese. Sprinkle with salt and pepper to taste (optional). Drizzle with a little oil (2 Tbsps or so) Bake until the crust is browned and the cheese melts, about 10 minutes. When pizza is done, top with remaining ingredients/toppings that are listed above or add extra ones that are your favorite. Cut into slices or wedges and serve. Enjoy!